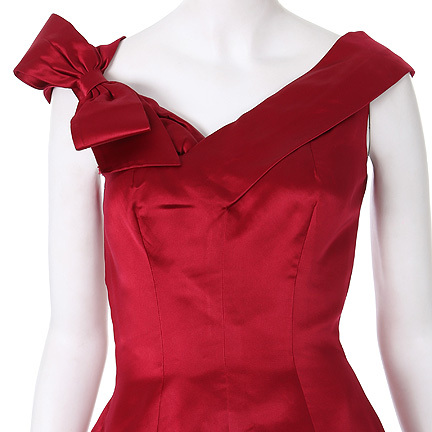 This dress was worn by Marion Cotillard in a feature for the December 9th 2012 issue of the “New York Times Magazine” called “Hollywood Heroines” as well as in a connecting segment of their video gallery. 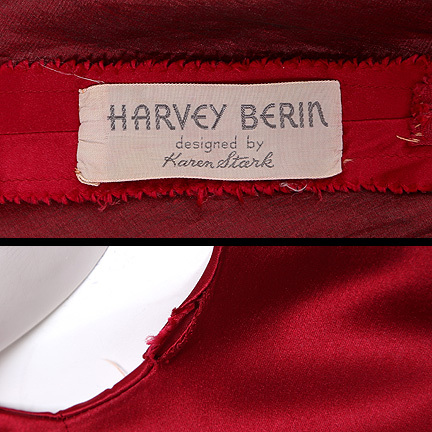 The 1960's silk wine cocktail dress with full skirt, low scoop neck, and bow has the original HARVEY BERIN label "Designed by Karen Stark". 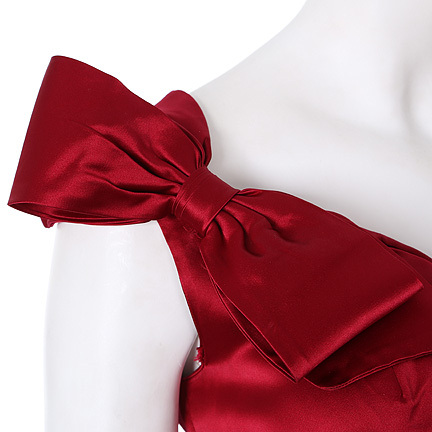 The garment has slight discoloration at the hem, due to Ms. Cotillard rolling around in mud and foliage, which adhered to the gown during filming. 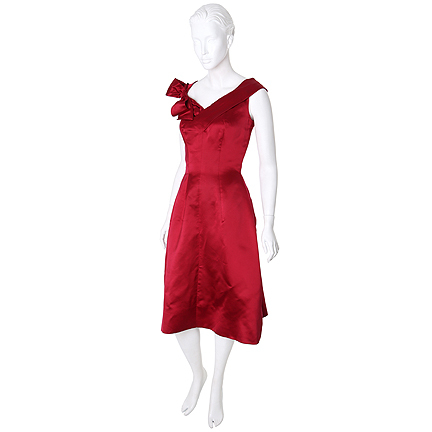 The garment has been thoroughly dry cleaned and there are no traces of mud remaining, however there are creases in the material from the moisture. 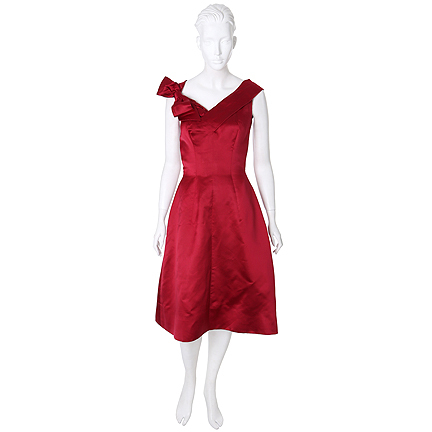 Ms. Cotillard can be seen wearing this dress for a photo in the “Hollywood Heroines” feature of the New York Times Magazine directed by Tierney Gearon. She also appears in a video portion of the feature entitled, “Wide-Awake” which also profiles other film “Heroines”. 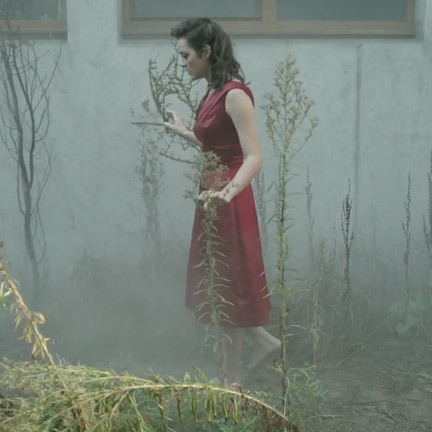 In Ms. Cotillard’s segment she is seen in a gloomy garden, fearful of a looming entity above her so she digs in mud and soon “transforms”, lying down amongst a colorful array of flowers in a surreal garden. 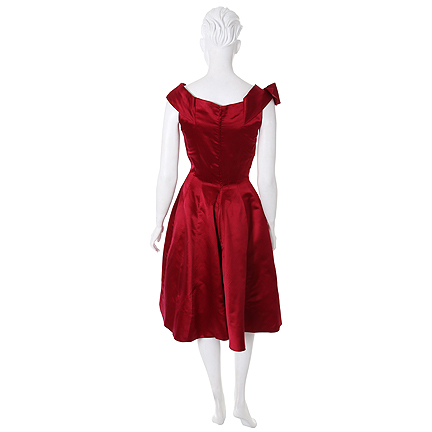 This garment is in good screen worn condition with evidence of wear from filming and is accompanied by a letter of authenticity from the costume company. Marion Cotillard is a French film actress celebrated for many roles including her transformation as Édith Piaf in “La Vie en rose” which earned her an Academy Award. She’s known in the US for her roles in “Public Enemies”, “Inception”, “Midnight in Paris” and “The Dark Knight Rises”.